Mary “Gail” Kyle was born in Kyle, Texas July 14, 1938 to Gordon and Marguerite Kyle. And oh how she loved and worshiped her “Daddy”. She grew up in New Mexico, graduating from Highland High in 1956 and attended the University of New Mexico where she met her husband of 60 years, Neil Gholson. They married in 1957 and in 1960 their first daughter Gay Lynn was born and three years later daughter Gerri Leanne. Gail was a charter member of Hoffmantown Baptist Church in Albuquerque and later joined Eastern Hills Baptist Church where she and Neil working with the youth group and made amazing life-long friends. In her 20’s she participated in Cat Shows with her beloved Tinky & Sister and came away with some blue ribbons to show for it. Although much of her life was spent in New Mexico her heart always belonged to Texas and in 1974 she rejoiced in the opportunity to return there when Neil took a job in Dallas. As life would have it her favorite place to visit became Santa Fe, New Mexico and favorite food, New Mexico cuisine. She was a Southern Living and mint iced tea enthusiast who never could resist a good recipe she loved trying new dishes and had a recipe drawer filled to overflowing to prove it. Just ask her for one and she would begin filtering through the drawer till she found it. In later years her greatest love was her grandkids and great grandkids for whom she would move mountains and looked forward to holidays with them with the anticipation of a child at Christmas. She was also a staunch football and basketball fan who rarely missed a game and thought Roger Staubach hung the moon (and stars). Traveling to new and familiar places with Neil was a hallmark of their life together. And again, passed this great love for travel and experiencing new places onto her daughters. 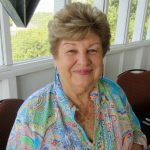 Her life was marked by an abundant love of friends, family, travel and playing bridge which she continued to do in winning style right up until a few months ago. She left her beloved Texas and went onto join the celebration in heaven on November 21, 2017. She is survived by her husband of 60 years, Neil Gholson, daughters Gay Lynn Freels & husband Timothy, Gerri Lawing Crow & husband Timothy, grandsons Andrew Lawing and wife Rachel, Jared Freels, Justin Freels and wife Courtnee, granddaughters Lindsey Lawing, Jodi Lawing Maria and husband Steven, Amber Freels Antle and husband Rob, great grandchildren Collin Lawing, Lucy Rae Lawing, Ellie Ethel Maria, Skylar Jean Lawing and Hudson Freels. She is also survived by two sisters Marsha Smith and Nancy Anderson. Service: 1:00 pm Saturday, November 25, 2017. at Lakeside Baptist Church. Visitation: 5:00 – 7:00 pm, Friday, Martin’s Funeral Home. Memorial donations to student camp are always a great idea. People wishing to do so can send donations to Lakeside Baptist Church, 500 W Bluebonnet Dr., Granbury TX 76048 with Student Camp Scholarship in the memo line. I'm so very sorry to hear of Gail's passing. My deepest condolences to the family.